The EU and its member states have committed themselves to the protection of their citizens, and a Europe that protects must be able to respond effectively when disaster strikes. 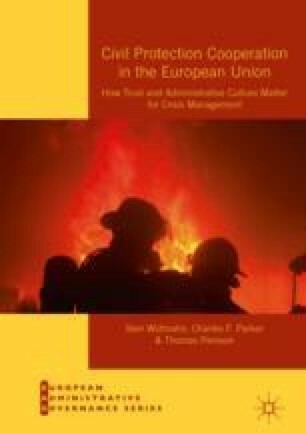 In this chapter the authors explain why they treat civil protection and crisis management as crucial cases for investigating which factors—such as trust, public-administration culture, and public-administration structure—facilitate or hinder effective EU cooperation. In addition to investigating the main divides and unifying patterns of cooperation that exist among the EU member states, the authors combine knowledge from crisis management studies together with insights from public and social capital studies to examine to what extent so-called ‘software factors’, such as culture and social trust, matter for achieving effective civil protection cooperation and crisis management. Cerni B., & Savic, M. (2015). Migrant Crisis Intensifies in Balkans as EU Wrangles on Solution. Bloomberg, October 26. Retrieved November 25, 2015, from http://www.bloomberg.com/news/articles/2015-10-26/migrant-crisis-intensifies-in-balkans-as-eu-wrangles-on-solution. European Commission. (2017c). rescEU: European Commission Proposes to Strengthen EU Disaster Management. Retrieved from http://europa.eu/rapid/press-release_MEMO-17-4732_en.htm?locale=en. European Commission. (2017d). rescEU: A New European System to Tackle Natural Disasters. Retrieved from https://ec.europa.eu/echo/news/resceu_en. European Commission. (2017e). EU: A World Leader in Helping Those Affected by Crises. Retrieved from europa.eu/rapid/press-release_MEMO-17-2661_en.pdf. European Commission. (2018). EU Civil Protection Mechanism. Retrieved from http://ec.europa.eu/echo/what/civil-protection/mechanism_en. European Court of Auditors. (2016). Special Report: Union Civil Protection Mechanism. Retrieved from www.eca.europa.eu/Lists/ECADocuments/SR16_33/SR_DISASTER_RESPONSE_EN.pdf. Peters, G. (2000). Governance and Public Sector Management: Four Main Administrative Traditions. Retrieved May 31, 2017, from http://web.worldbank.org/WBSITE/EXTERNAL/TOPICS/EXTPUBLICSECTORANDGOVERNANCE/0,contentMDK:20134002~pagePK:210058~piPK:210062~theSitePK:286305,00.html#1. Wilkinson, A. (2016). The Brexit Vote Is Really About Just One Thing. New Republic, June 21. Retrieved June 29, 2018, from https://newrepublic.com/article/134507/brexit-vote-really-just-one-thing.